To understand how the ramjet engine works we must review the physics involved. In other words, we must think about the way the universe around us works. Jet engines and rocket engines all work pretty much like the balloon drawing at the right. Pressurized gasses (arrows) inside the balloon push equally in all directions. Forces trying to push the balloon in one direction are canceled by equal but opposite forces trying to move it in the opposite direction (red arrows). If the neck of the balloon is tied off, forces in all directions cancel so the balloon does not move. If the neck is open there is no balloon for forces to push against at the opening. Since there is no push against the balloon by the gasses escaping through the opening (blue arrow), the unopposed force of the green arrow pushing on the balloon causes it to move and the balloon flies away like a rocket. Rocket engines work in exactly this way. The combustion chamber is closed except for an opening at the exhaust nozzle. Burning fuel produces high pressure gasses that escape through the nozzle at the rear, and gas pressure at the front end of the engine pushes the rocket forward. Jet engines also work the same way, but they have an air inlet at the front as well as the exhaust opening at the rear. Turbojets have a compressor fan that pulls air into the engine. The compressed air inside the engine pushes against the compressor fan blades at the front of the engine and against the burning exhaust gasses at the rear. The compressed air pressure matches the exhaust gas pressure so the unopposed force is transferred to the compressor fan blades and the internal engine parts to push the jet forward. In effect, the compressed air entering the engine "plugs the hole" at the front of the engine so it works like the balloon. Ramjets are tubes open at both ends, with few internal parts and no compressor fan to force air into the engine. So what causes the combustion gasses to escape only at the rear end, and what do the exhaust gasses push against to cause forward thrust? To understand this you need to know something about how gasses behave. When something causes a noise, such as a door slamming or a firecracker popping, it causes a pressure wave to move through the air, When this wave reaches us our ears translate the sudden pressure change into the sound we hear. The pressure wave is really just air molecules bumping against each other. The molecules normally just move around randomly, moving this way and that. When the firecracker pops it releases high pressure gasses that rush outward, pushing against the air molecules. These molecules in turn move outward and bump into others, pushing them along to bump into yet more air molecules. Think of a bunch of balls lined up on a pool table. The cue ball strikes the first, causing it to move and strike the second. When it does the energy of motion is transferred to the second ball and the first ball stops. Likewise, the second ball strikes the third, transfers energy to it, and stops. In this way the energy passes from one ball to the other, and this energy "wave" flows down the line of balls from the first to the last. Although the distance from the first to last ball may be great, none of the individual balls moves very far. 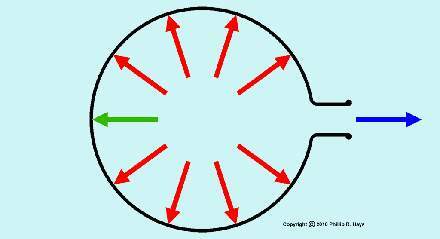 This is how the pressure wave moves through the air, passing from molecule to molecule. The wave is just a lot of molecules that are no longer moving randomly, but are all moving in the same direction at the same time until they bump into another air molecule and pass energy to it. After the wave passes the air molecules go back to randomly bumping into each other. The pressure wave travels through the air at the speed of sound. This is the fastest speed that the pressure wave can move through the air. However, it is not the fastest speed that something can travel through air - supersonic missiles move faster than the speed of sound. What happens to the air molecules when something pushes through them faster than they can get out of the way is important. As an object moves through the air it pushes aside the air in its path. The moving air forms a pressure wave that moves outward at the speed of sound. In the picture below the arrow labeled "Speed of sound" represents the distance sound travels during the time of flight of the missiles. The missile on the left is moving at half the speed of sound (Mach 0.5). The pressure waves created as it moves through the atmosphere are moving twice as fast as the missile and dissipate in all directions. In all cases the pressure waves race ahead of the missile. Each semicircle shows how far the sound wave has traveled since the missile passed the numbered positions. Notice that the distance between waves is shorter in front of the missile than off to the side of the missile - the waves are compressed ahead of the missile. However, they do not overlap to generate a shock wave. In the middle image the missile is moving at the speed of sound. The pressure waves expand outward at the speed of sound but they cannot move ahead of the missile. At the leading tip of the missile all waves are compressed so they overlap, but they dissipate normally elsewhere so a shock wave is not propagated. In the right hand picture the missile is moving faster than the speed of sound. The pressure wave cannot move as fast as the missile so the missile races ahead of the pressure waves. Consequently all waves moving outward from the missile's path combine to create a high pressure conical "shock wave" emanating from the nose of the missile, moving outward through the air at the speed of sound, like the wake of a boat moving through water. 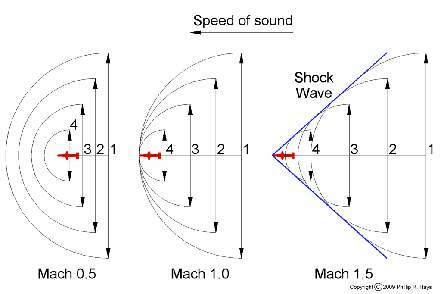 When this shock wave reaches our ears we hear a "sonic boom." It is this supersonic shock wave that is important to ramjet air intake functioning, and it was the cause of major headaches in the design of ramjets that would work reliably. It is important to remember that the air molecules in this wave are moving at the speed of sound, and no faster. The simplest air intake design is just a hollow tube with a circular opening - a pipe. Imagine a pipe fastened to a supersonic airplane or rocket. When the pipe is propelled through the air at supersonic speeds the edge of the opening pushes air molecules out of the way, forming a shock wave. On the outside edge of the pipe the shock wave moves outwardly just like it does around the nose of a supersonic bullet. However, on the inside of the tube the shock waves from all around the opening converge, as shown by the dashed lines. The air molecules moving away from the inner edge of the opening run into other molecules moving inward and the pressure wave can go no farther. Pressure builds up behind the shock wave, compressing the air in the tube and slowing the rate at which it flows through the tube. The air passes through the tube slower than the speed the tube passes through the surrounding air. As a consequence, air enters the opening faster than air can pass through the tube and escape at the rear. Air molecules pile up inside the tube, and as more and more are crammed in the pressure inside the tube increases. As the pressure increases it tries to push air back out through the front of the tube. Equilibrium is reached between the pressure of the inrushing air and the pressure of the air in the tube, and the supersonic shock wave at the inlet is reshaped to be flat across the inlet opening. 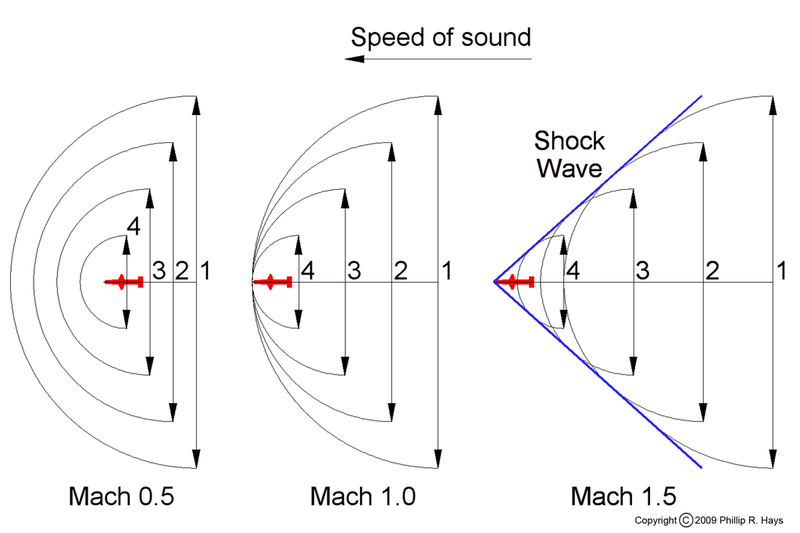 In fact, the edges of this shock wave are typically perpendicular to the inside surface of the tube, so it is called a "normal" shock wave (normal means perpendicular). Now we need to rethink the relative motions of the tube and the atmosphere. It is the tube that is moving faster than the speed of sound, and the air is standing still. However, the concept of relativity allows us to think of the situation as if the tube was standing still and the air was rushing by at supersonic speeds. In fact, this is what happens in a wind tunnel where high speed air is blown through the tunnel and a test missile is bolted firmly in place. For discussions of how the ramjet engine works it is very useful to think of how the air moves through the engine, as if the engine was not moving and the air was. As pressure rises in the tube air temperature also rises. Since the inside walls of the tube prevent outward expansion of the air in the tube, and the air rushing in the front prevents escape that way, the hot high pressure gasses can escape only from the rear where they expand rapidly and return to the temperature and pressure of the surrounding air. However, this happens only when the tube is moving through the air very rapipdly. When the hot gasses escape at the rear of the tube they are accelerated as the pressure drops. You see the same thing when water escapes through the end of your garden hose. The higher the water pressure inside the hose the faster the water flows from the hose. The higher the pressure inside the ramjet tube, the faster the gasses escape at the rear. Because the gasses are heated as they are compressed into the tube, the pressure increases even more and they escape the rear even faster. As the gasses are accelerated out the back of the tube, an equivalent forward thrust is generated (Newton's "equal and opposite actions"). This is called the Meredith Effect, after F. W. Meredith who first proposed the idea in 1936. But what does this thrust push against? The inside of the tube is smooth, and there are no surfaces for pressure to push on in a forward (or aft) direction. Because air flowing into the tube is slowed and compressed, it acts as drag working against motion through the air. This added drag consumes some of the power from the engine propelling the tube. The thrust from the exhaust gasses pushes forward against the compressed air at the front of the tube. This reduces the energy that the engine moving the tube has to expend, so the tube can move faster. The faster the tube moves, the more air enters the front, causing temperature and pressure to rise inside the tube, causing the gasses to escape at higher speeds at the rear, resulting in greater thrust. This sounds suspiciously like a perpetual motion scheme, and such things are impossible. Hollow pipes do not fly through the air at supersonic speeds, magically propelling themselves, because the drag from moving through the air greatly exceeds the thrust that is produced by the heated gasses. As things move faster through the air the drag (resistance to motion through the air) increases. We experience this effect directly when we stick our hand out the window of a moving car. The faster the car moves the greater the force on our hand as the air rushes around it. As a simple pipe is accelerated drag increases much faster than thrust. If we want the tube to work as an engine we need to increase the thrust so it exceeds the drag. This is accomplished by heating the air inside the tube even more by burning a fuel in it. The fuel is sprayed into the airstream near the front of the tube and ignited near the rear. When the fuel burns the heat of combustion greatly increases the pressure inside the tube, increasing thrust as the superheated gasses escape at the rear. However, if the tube is just sitting still when we ignite the fuel the burning gasses blow out both ends and the tube doesn't go anywhere. To get the ramjet engine to work we have to blow air into the intake at very high speeds, causing the pressure inside the tube to increase. This is typically accomplished by using another jet engine or a rocket motor to accelerate the ramjet to speeds where it will work. When the fuel ignites, causing the gasses to heat up and expand, the pressure from the air entering the front of the tube prevents the explosion from moving forward and out the front. Since there is nothing preventing the gasses from escaping at the rear, this is where the hot combustion gasses go. The pressure from the burning fuel-air mixture pushes on the walls of the tube and on the gasses at the front of the tube, but there is nothing to push against at the rear of the tube. The result is a forward thrust. Even so, a hollow cylindrical pipe can't generate enough thrust to be useful. With a few modifications the pipe becomes a ramjet. Reducing the diameter of the inlet relative to the rear end of the tube provides a surface for pressure inside the tube to act upon, generating forward thrust. If you spray fuel into the incoming air and then ignite it high temperatures and high pressures are produced. At the exhaust end of the engine a nozzle restricts flow out of the engine. This slows the airflow through the engine, further increasing the operating pressure, allowing more fuel to be burned. The open area of the nozzle is matched to the intake area to obtain optimum operating conditions inside the engine. The nozzle causes the escaping combustion gasses to be accelerated to high velocity. It is the Meredith Effect on steroids. The ramjet works by accelerating the air that is passing through it. For every action there is a reaction, and as the hot high speed gasses escape through the nozzle the engine is propelled forward. 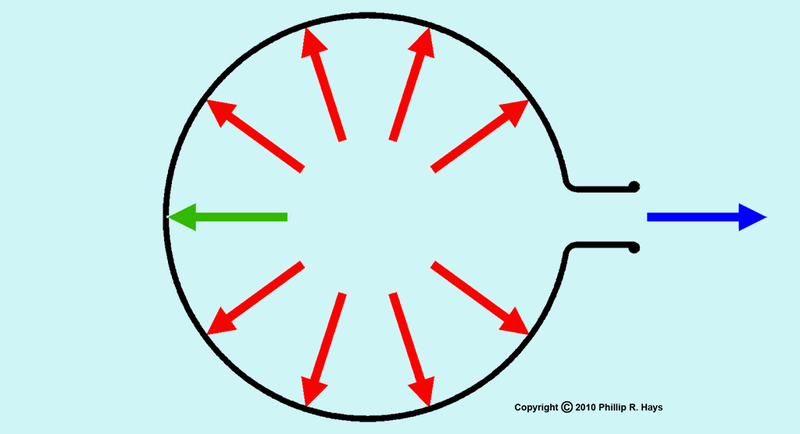 Inside the tube a steady state is obtained where the pressure in the combustion chamber is balanced by the pressure of the air flowing into the engine behind the normal shock front. As the engine moves forward it ingests more air, keeping things going. As it goes faster it takes in a larger amount of air, and that means it exhausts more air, producing greater thrust. The faster it goes, the faster it goes. Fuel flow is controlled to achieve the desired speed. At low velocities drag is greater than thrust, so the engine cannot propel itself through the air. At velocities about 80 percent of the speed of sound the thrust produced by a ramjet engine just equals the drag through the air (this depends upon how streamlined the missile is). At higher velocities the thrust produced by the engine exceeds the drag and the engine propels itself forward. There is a practical limit to the speed of a simple ramjet engine. If pressure inside the tube rises too far the normal shock front is blown out of the tube allowing compressed air to spill out around the front of the tube. This reduces the amount of air passing through the tube, causing thrust to drop. As a consequence this type of ramjet is limited to a top speed of only about Mach 1.2, not as fast as turbojets can go. For higher speeds the ramjet air intake must have a more efficient mechanism to compress the incoming air. Ramjets work by ingesting relatively low speed air and expelling the air at a higher speed. The difference in speed results in a forward thrust. The burning fuel creates higher pressures inside the engine, causing higher exhaust speeds. But the thrust of the engine depends entirely upon how much air flows through it. No matter how hot the burning air-fuel mixture is, and how high the pressure, if not much air flows into the front of the engine not much thrust is produced. So the trick to improving ramjet efficiency is to increase airflow through the engine. In a way this is a chicken-and-egg problem. To get more air the missile has to go faster, and to go faster it must take in more air. Adding more fuel to the air inside the engine causes greater amounts of heat to be produced, and increases the temperature of the burning fuel-air mixture. Greater heat causes increased pressure, and this produces higher velocity exhaust gasses. So burning more fuel increases the velocity of the exhaust gasses, causing the missile to go faster. However, there is a limit to how much fuel can be burned. If the air-fuel mixture is too rich (too much fuel) it won't burn. So it is necessary to match the fuel flow to the amount of air passing through the engine to get the maximum sustainable burning rate. Adding more fuel increases the thrust, but again the maximum thrust is limited by the amount of air. The way to get around this problem is to increase the pressure of the air inside the engine (higher pressure = more air). This improves combustion efficiency and allows greater amounts of fuel to be consumed. The limit of the simple open tube engine is reached when the pressure inside the tube exceeds the pressure of the air flowing into the inlet. Some means was needed to increase the pressure at the front of the missile. The first step in achieving this goal was the addition of an obstruction in the opening of the tube. This gave more structure for the high pressure gasses inside the tube to push on, so it increased the thrust somewhat. But blocking the intake opening would reduce the amount of air flowing in, wouldn't it? No, it doesn't, if it is done right. The obstruction is called an innerbody. It is pointed on both ends and thick in the middle and fits inside the intake tube. Air passing into the tube must flow around the innerbody, and the area around it is less than the area of the intake opening. Consequently the air is compressed as it flows around and reaches a maximum pressure in the narrow throat between the innerbody and the intake tube. The same amount of air flows into the engine, but it is raised to a higher pressure. This increases the pressure that the burning gasses must push against, causing the overall pressure inside the tube to increase. Higher internal pressures mean greater amounts of air in the engine, so more fuel can be burned. The result is still higher pressures, increased exhaust gas speed, and greater thrust. Remember the "normal" shockwave that formed at the opening of the simple tube? That was the limiting factor for airflow into the simple tube engine. Air flow into the engine was limited by the area of the shock front. Excess air pushed aside and flowed around the outside of the engine. This limited the amount of air that flowed into the simple open tube, and that limited the amount of thrust that could be produced. 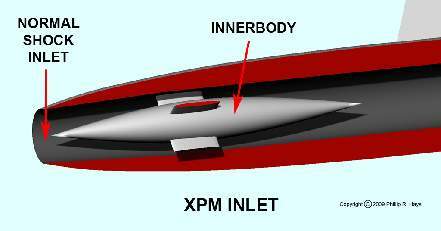 Adding the innerbody inside the tube doesn't change that limitation, although it does allow more efficient combustion and causes the missile to accelerate more rapidly. To get the missile to go faster it was necessary to change the way the supersonic shock waves form at the front of the missile. The solution was simple - move the innerbody forward until the conical tip extends out of the inlet tube. The supersonic shock wave then forms at the tip of the cone in front of the opening. This shock wave is conical and has a much greater surface area than the simple normal shock wave. The conical supersonic shock front allows more air to pass into the opening than a simple planar shock front. The air behind this front moves slower than the air entering the front, so the pressure increases. In addition, because of the conical innerbody this air is squeezed into a smaller volume before it enters the intake opening, compressing the air further and increasing the amount of air at the opening. Another shock wave forms normal to the surfaces of the innerbody and the air intake. At the normal shock front the precompressed air slows to subsonic velocity as it enters the intake. This type of engine is called a subsonic flow ramjet because the air flows through the engine at less than the speed of sound. Many different ideas were proposed and tested in experiments to determine the optimum innerbody shape. The angle of the conical shock front depended upon the velocity of the missile. This caused the optimum position of the shock front to change with speed, influencing the efficiency of the engine. The position of the intake cone influenced the position of the supersonic shock front. For variable speed operation it was necessary to move the innerbody cone forward and backward to keep the shock front in the optimal position relative to the intake opening, but the position of the middle of the innerbody must remain constant to achieve maximum compression inside the engine. Complicated arrangements for moving the innerbody cone were tested, but these increased the weight of the engine and reduced space available for other essential parts. In the end it was decided to operate the Talos missile at a constant speed in order to allow a fixed innerbody shape. Optimal design called for the conical shock wave to impinge directly on the leading edge of the air inlet tube where it would meet a "normal" shock front perpendicular to the innerbody surface. It was difficult to maintain this "critical" condition. It was also possible to operate the engine in a "supercritical" condition with the normal shock front farther into the air intake, but this called for lower internal pressures, leaner fuel-air mixture and lower power. Talos operated in the "subcritical" condition with higher internal pressures to promote more efficient combustion. In this state the high internal pressure causes the normal shock front to advance forward of the cowl lip to join the supersonic shock wave. As air passed through the normal shock wave it decelerated to subsonic speed and increased in pressure again. The engine was supplied with the maximum amount of air that could flow into the intake, and any excess spilled out around the cowl. Talos Missile Talos missile system information. W-30 Warhead Development of the Talos nuclear warhead. Thanks to David Delaney for some very interesting discussions that helped me correct errors and reword parts of these ideas more clearly.